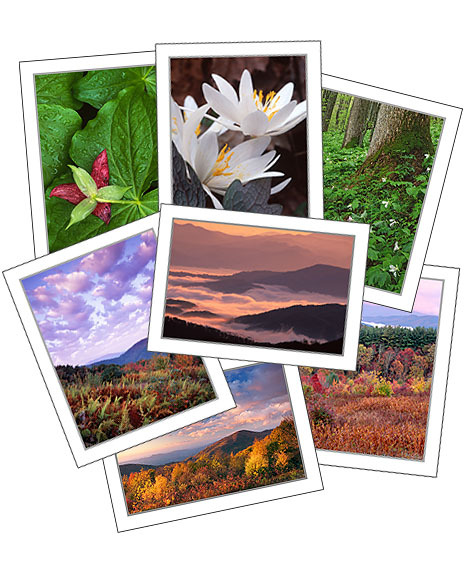 Lori offers individual instruction, photography workshops and winter photo tours in her own backyard: the Max Patch area of Pisgah National Forest. Multi-day private workshops and winter photo tours require a minimum of three people and are customized to the interests of the participants. Seasonal workshops are designed for photographers at all levels and include both classroom and field instruction in using light, composition, and technique to photograph the diverse and often chaotic environment of the Southern Appalachians. Both tours and workshops are authorized under a Special Use Permit by Pisgah National Forest and include lodging at Lori's vacation rentals, "Wiley's Place," situated on an open ridgetop in the heart of the Max Patch area. There, participants can photograph star trails from the deck or kick back in the hot tub after an exhilarating day in the field. Private workshops usually start on a Friday afternoon and run through Sunday morning, but can be scheduled on other days.Winter photo tours are scheduled when snow is in the forecast and run two nights for the best chance of capturing beautiful snow and rime ice. For more information, to schedule a workshop, or to sign-up for email notification of winter photo tours, please contact Lori Kincaid Photography. Private Instruction: Contact Lori for full or half-day rates. Winter Photo Tour Tuition (three person minimum): $365, includes limited instruction, two nights lodging, and two meals. Private Workshop Tuition (three person minimum): $425, includes instruction, and two nights lodging. Seasonal Workshop Tuition (limited to six photographers): $695, includes instruction, food and three nights lodging. Non-photographer spouses/companions are welcome at a reduced fee of $395 (includes food and lodging). Winter Photo Tour, 2016-2017. Due to its location on the western edge of the Blue Ridge Province, the Max Patch area is one of the finest and most accessible locations for snow and ice photography in the Southern Appalachians. Lori will take participants to the best area locations for winter photography and will photograph with you while offering limited instruction. Since snow can't be predicted well in advance exact dates haven't been scheduled. Instread, Lori will send out an email notification two to four days before snow seems likely. If enough people are able to attend (three minimum) we’re on! You must have tire chains or an AWD/4WD vehicle to attend. Moderate to strenuous hiking is required depending on snow depth. Spring Workshop, April 27 to April 30, 2017. Spring wildflower displays in the Max Patch area are some of the most extensive and diverse found anywhere in the Southern Appalachians. At elevations ranging from 1900 ft in Harmon Den to more than 4600 ft atop Max Patch Mountain, Lori will take you to special locations known only to a few where you can photograph blankets of large-flowered trillium, dramatic vistas, and closeups of untold species of flora. Easy to moderate hiking is required. © 2001-2017 Lori Kincaid. All Rights Reserved.